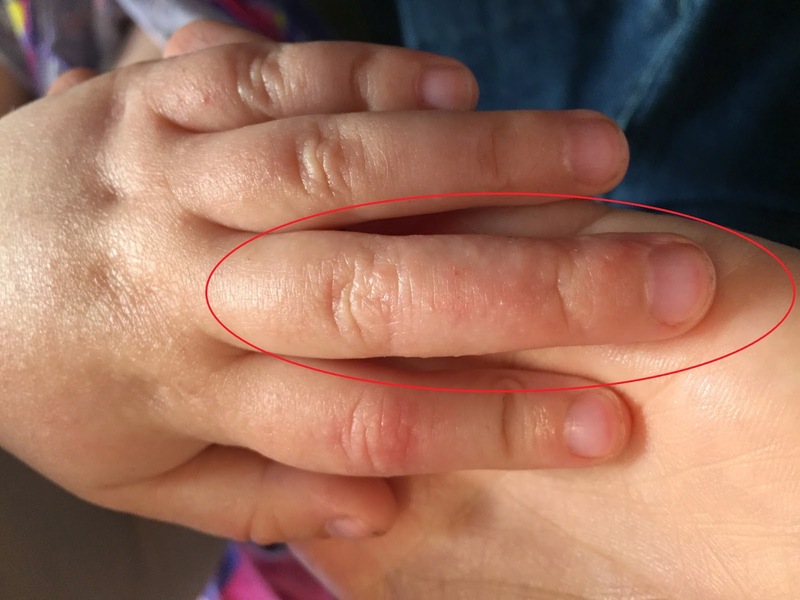 By six weeks into Dr. Aron's treatment, Penny's skin was looking great, just occasionally little itchy spots on her wrists, knees, and ankles. Pollen season had started, and her nose was running and sneezing, so a little itchiness didn't concern me too much. I wasn't careful enough to keep her out of the sand and dirt and grass though. Her troublesome ring finger started to act up again and upping the number of applications of cream didn't help this time. Then one night Penny woke up tearing at her hands again. In retrospect, I should have immediately used Dr. Aron's prescription, but since it wasn't our scheduled time to apply it, I used Cerave instead. She had trouble settling back to sleep. In the morning, she was rubbing her hands again. Little blisters were starting to form. I felt sick and panicked. ﻿﻿My brain filled with memories of the times before Dr. Aron. I remembered spending the whole day in and out of baths and wet wraps. Applying lotion over and over. Penny tearing off the socks and rubbing her hands raw. It was hard to quiet all those thoughts that morning, but I tried. I washed her hands in case her skin had an irritant on it and applied our prescription. Penny calmed down. In fact, she didn't bother her hands again until lunch time. This is a mild version of dyshidrotic eczema or pompholyx. It starts as clear, fluid filled blisters. One of the best things about Dr. Aron is the continual support. In the past, with every flare, I was on my own. This time, I took pictures of Penny's hands and emailed Dr. Aron. He replied by that night. I knew he was likely to tell me to increase the apps on her hands. (We had been at two a day for quite a while.) So when Penny started to rub them again at noon, I did another app of cream. That calmed her down until bedtime. By evening, the blisters were already starting to subside. Dr. Aron advised me to increase the cream applications to 4 times a day and to wrap her troublesome ring finger in saran wrap each night. The hands were better in days and the ring finger cleared within a week. At eight weeks in, for the first time, Penny has no trouble spots at all. Now we are applying cream twice a day everywhere but her hands, which are down to three. Persistent eczema can cause skin discoloration and the constant scratching can cause thickened skin (lichenification), but even that is disappearing over time. (Dr. Aron told me it would in one of his first emails.) I was amazed at her progress that first week, but now it's interesting to look back and see how far her skin still had to go. I'm extra careful now to keep Penny from playing in the grass, sand, and dirt, and we wash hands every time we come inside. In my heart, I would like to be more lax about outside--letting her run out barefoot, build sandcastles or sit in the mud--but that probably contributed to the dark place we were in last summer. So I make her keep her pants and shoes on outside. We play on the pavement a lot, riding her trike and throwing balls. As her skin continues to heal, it may tolerate more or it may not. She's allergic to pretty much everything outside, so we may have to continue to avoid grass. I hope that eventually she'll be able to dig in the dirt though. Either way, I would rather stay in the good place we've found now. Her first four years have been tough, but I'm confident we are on our way to different times. Happy birthday, Penny! Enjoy that clear skin! Glad to hear she is improving, sorry about no outside grass etc. that is rough for you both.